We were recently introduced to Lucy B by Jillian, author of the Skin Chronicles. Jillian shared some of her lip gloss with us and we were so excited! It’s so pretty and smells like candy! Yum!! We decided to find out a little more about Lucy B! MEET LUCY BFounder Lucy Baldock-Sacchi originally from London, UK; has been working as a celebrity & beauty make-up artist for over fifteen years working extensively with many celebrities including Claudia Shiffer, Johhny Depp, Elle McPherson, Gwyneth Paltrow, Kylie Minogue in Europe, USA and Australia; and for prestigious magazines such as Vogue, Harpers Bazaar, Elle, In style, Marie Claire and Vanity Fair. Collaborating with top advertising Photographer- husband Marco Sacchi, they created the image and soul of Lucy B.
Lucy and Marco’s background, combined with working within this high profile industry, created the understanding, knowledge, energy and connections that manifested itself into the exciting, fresh Australian Range Lucy B.Cosmetics: The Natural Alchemy of Beauty & Healing. With the simple philosophy that there was a gap in the market for the perfect combination of natural, organic ingredients & colour cosmetics, Lucy designed a fresh range that encapsulates the natural resources found only in Australia. Lucy B is the only colour range in the world to have infused the natural Australian Flower Essences within their products offering you a taste of the Australian energy & lifestyle. PHILOSOPHYDiscover a new world of beauty and healing with Lucy B Cosmetics. Like an alchemist of old, Lucy B spins the elements of Nature into cosmetic gold. Here, ancient healing lore and plant wisdom come together with the most modern technology, innovative organic ingredients and hip, seductive packaging. 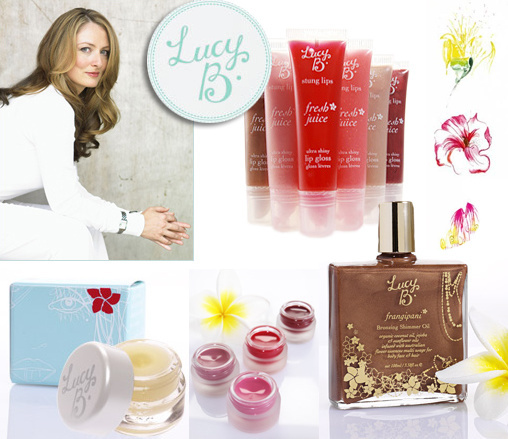 Lucy B Cosmetics is unlike any other beauty range. By including Australian Bush Flower Essences and pure aroma-therapeutic extracts in every product, we have harnessed the power and magic of the Australian botanical apothecary to bring you benefits that go way beyond beauty. The result is a range that helps transform the body, mind and soul. Technically known as vibrational healing, the flower essences work by subtly balancing the energies of the body and being. Based on the idea that negative mental, emotional and spiritual states impact negatively on the body, the essences help rid the body of toxic emotions, fears and imbalances. Lucy B also includes pure, organic essential oils for their aromatherapeutic healing properties in most products. Essential oils, the pure extracts of plants, trees, fruits and herbs, are powerful natural chemicals with anti-bacterial, anti-inflammatory and anti-viral properties which have an affinity with the skin and body. Lucy B employs both flower essences and organic essential oils because they’re dynamic, active and highly sensitive wholistic healing agents.